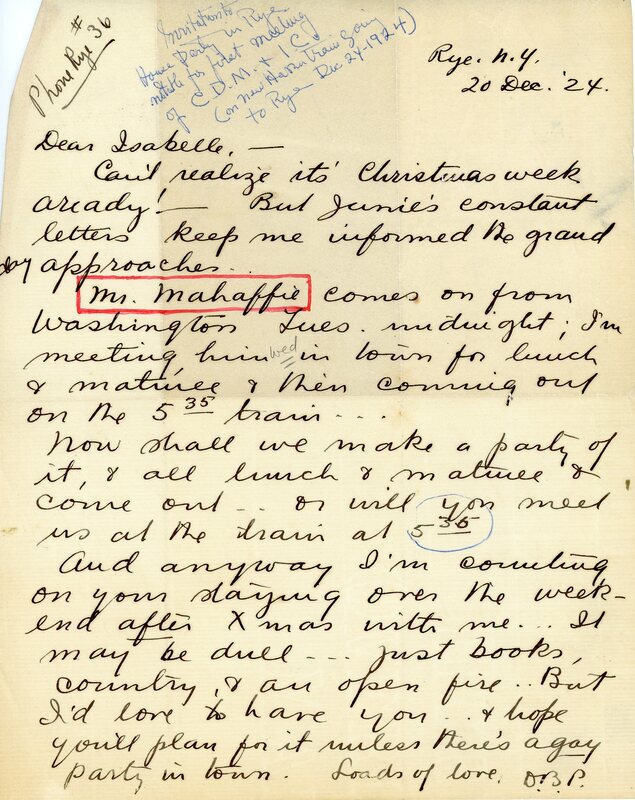 Dorothy Putnam wrote Isabel Cooper on December 20, 1924, inviting her to her Rye, New York home, and announcing that Mr. Mahaffie would be arriving that next Tuesday (December 23rd) at midnight. Mr. Mahaffie was clearly a topic of prior conversation. Isabel’s friend Dorothy, whom she called a “festive lady who loved people, giving parties, and matchmaking,” was determined that Isabel should meet Mr. Mahaffie. Dorothy was to see Mr. Mahaffie in New York City on Wednesday, Christmas Eve, for lunch and a matinee. She urged Isabel to join them for the lunch and show, or at least join Charles and Dorothy to make the 5:35 pm train to Rye. Everyone was headed, ultimately, for a Christmas Eve party at the Putnams. Isabel was a fascinating, adventuring young woman in the early 1920s, at the beginning of her thirties. And she was single. Hints in things she wrote later suggest tries at romance, but perhaps her exotic life as a scientific expedition artist, and perhaps also her temperament, left her unattached. But Dorothy was inspired to match her great friend Isabel with her husband’s friend Charles Mahaffie. It’s hard to imagine why. Perhaps Dorothy fixed on the idea that opposites attract. Dorothy Binney Putnam was a daughter of Edwin Binney, who founded and co-owned Binney & Smith, Inc., the maker of Crayola crayons. She was married to George Palmer Putnam, a grandson of the founder of Putnam & Sons, the publishers. A few years later, George would drift to a new interest, Amelia Earhart, who fascinated him as a project–a woman aviator he could use to drive book sales–and as a lover. And Dorothy had her own affairs. Charles was forty, an established bachelor who lived with other unattached men in the University Club in downtown Washington, DC. He was a hard-working, Oklahoma-farm-raised Rhodes Scholar. A gruff government lawyer, working in the Federal Government’s Interstate Commerce Commission on the then-vital matters of railroad regulation. The Putnams knew Charles from the 1910s in Portland, when George and Charles had both been connected to city politics and business affairs in the 1910s. But the Putnams had moved east for George to work in the family publishing business. They came to know Isabel from New York Society. Isabel and Charles were, separately, recurring visitors at the Putnam’s estate at Rye, New York. George and Dorothy supposed that this mis-matched pair would take to each other. They arranged a Christmas holiday at Rye and invited Isabel and Charles. So two people, world’s apart in temperament, background, and experience, got on a train for Rye on Tuesday, December 23, 1924. Fifty or more years later, Isabel told me how she and Charles met before they were supposed to, on the train to Rye, so perhaps Dorothy didn’t take the same train after all. The two hit it off and realized they were the pair intended to meet at the Putnams. 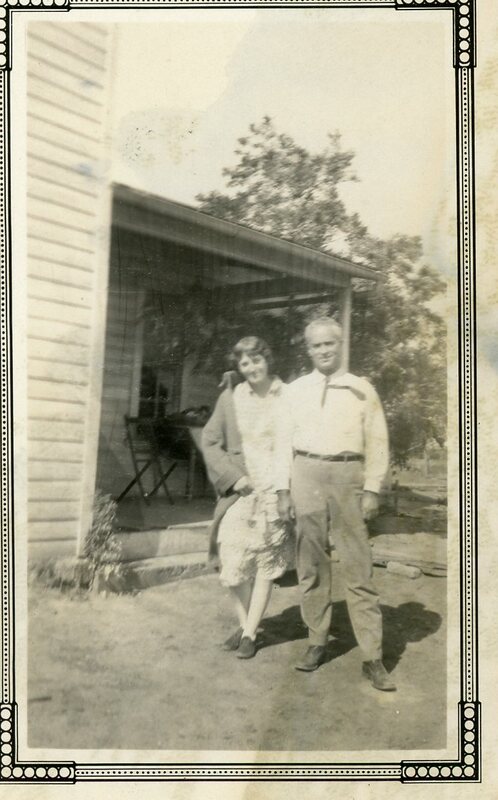 They got a laugh out George and Dorothy when they showed up at Rye, already acquainted. George, Isabel told me, remarked that since they’d already met, there was really no reason to go through with the festivities. But they spent at least a few days together as guests of the Putnams. And Dorothy’s matchmaking proved spot on. 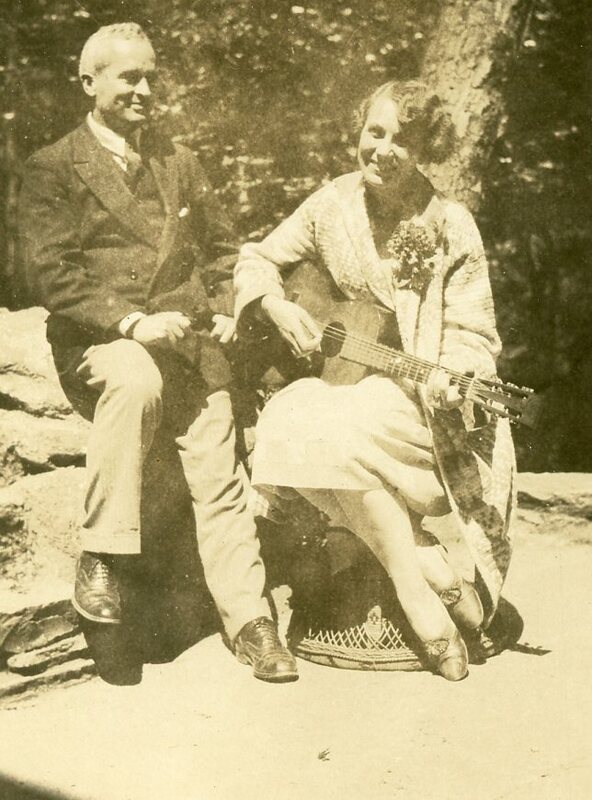 Charles and Isabel were married in August 1928. Isabel moved with Charles into an apartment in Washington and began a life very different from what she lived. She became a housewife and mother, though never typical at either. She continued her painting, soon forgoing paid work for doing art that pleased her. Her years of exploring the tropics were over. i Letter, IC to CDM, from the Canal Zone, March 27, 1925.
ii Letter, CDM to IC, January 8, 1925.